The first game is streaming now on YouTube now, sponsored by HSBC. The world's local bank indeed. The first match is Deccan Chargers vs. Kolkata Knight Riders. The quality is about as good as you'd expect (i.e. not very) but you can see what's going on, and judging from the number of tweets using the #youtube_ipl hashtag (about 5-10 a minute) it's pretty popular. 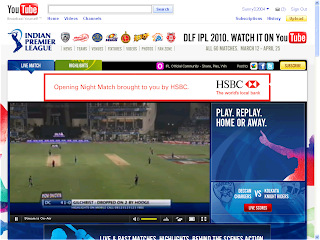 Video ads are also playing between occasionally, as they would if you were watching on commercial TV, and there's an HSBC banner ad that hovers over the screen occasionally.